HTC officially unveiled the HTC Rezound at a dedicated event it held in New York today. 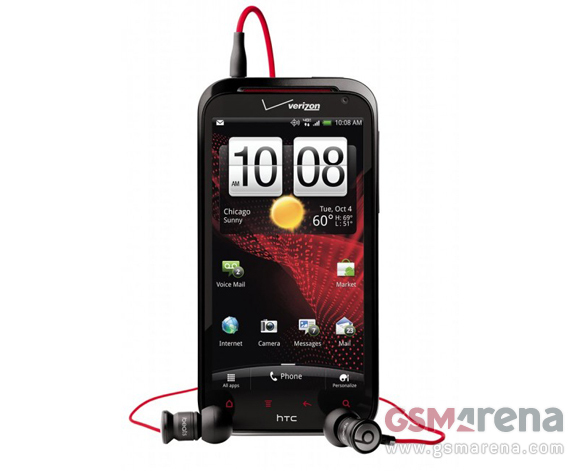 Leaked numerous times before, the HTC Rezound with Beats Audio is the company's new Android flagship. The Verizon-exclusive smartphone will be the first US droid with Beats Audio and will come with LTE support. The HTC Rezound runs Android 2.3.4 Gingerbread with Sense 3.5 on its 4.3-inch 1280x720 pixels display and HTC promised that it will be updating it to Android 4.0 Ice Cream Sandwich in early 2012. The Rezound will be the first smartphone with a 720p screen to hits the big Red (the Galaxy Nexus will actually become available a few days later), and is the only one on the market to boast a pixel density of 342 ppi. Powered by a 1.5GHz dual-core Scorpion processor and sporting 1GB of RAM, the HTC Rezound shouldn't have any issues in the performance department. Storage is covered, too, with 16GB of on-board storage and a 16GB micro SD card included in the retail package. As we were at the HTC Rezound announcement event we are able to bring you a bunch of live photos of the device. I think it will. And the Beats Audio just makes it better.